Faster and Louder: The Bidons are back! I always love it when a band shows great promise and then proceeds to fulfill it beyond my expectations. You may recall I was quite high on an Italian band called The Bidons a while back. I was so impressed with their throwback '60s garage sound that I suspected they may have been time travelers. Well, The Bidons have followed that very good debut with a truly great LP! Heeding the "If it ain't broke, don't fix it" adage, these cats continue to rip out primitive, high energy rock n' roll that brings to mind past greats like The Sonics, Standells, Seeds, and Shadows of Knight. There was little attempt here to mess with a winning formula. But on the strength of a sharpened songwriting acumen and some stellar production from Ferdinando Farro, Back To The Roost advances The Bidons to the top of the neo garage heap! Recorded live in the studio, this ten-songer plays to the strengths of a band that has built up its chops by slugging it out in the bars and clubs for nearly a decade. Plain and simple, these guys rock! As always, you can expect crazy good drumming, some killer guitar solos, and a singer who always picks the right time to let out a howl. And while I thought the group's choice of cover songs last time was really cool, I'm very impressed that an album full of original material turned out even better! The songs are mostly in the neighborhood of two minutes - with nary a ballad in sight! Tracks like "Hell, Yeah!" and "Shout It Out (Burn It Down)" are classic three-chord jolters that will quickly have you jumping around your bedroom like a maniac. And while the primary influences remain unchanged, this album really plays up the British Invasion and R & B elements of '60s garage rock. "Raw, Naked & Wild" is like a mash-up of The Sonics and early Kinks and is probably my favorite Bidons song to date. Equally good is the title track - a bluesy smoker that the Pretty Things or Yardbirds would have been proud to have written. Even with minor dabblings in Stoogey proto-punk ("Grinning Feeling") and psychedelic rock ("Psychotic Direction"), Back To The Roost is as pure of a rock n' roll record as you could ever hope to hear. Farro does an amazing job of making the album sound like it could have been produced in the '60s, and I can't name a single track that should have been dropped. 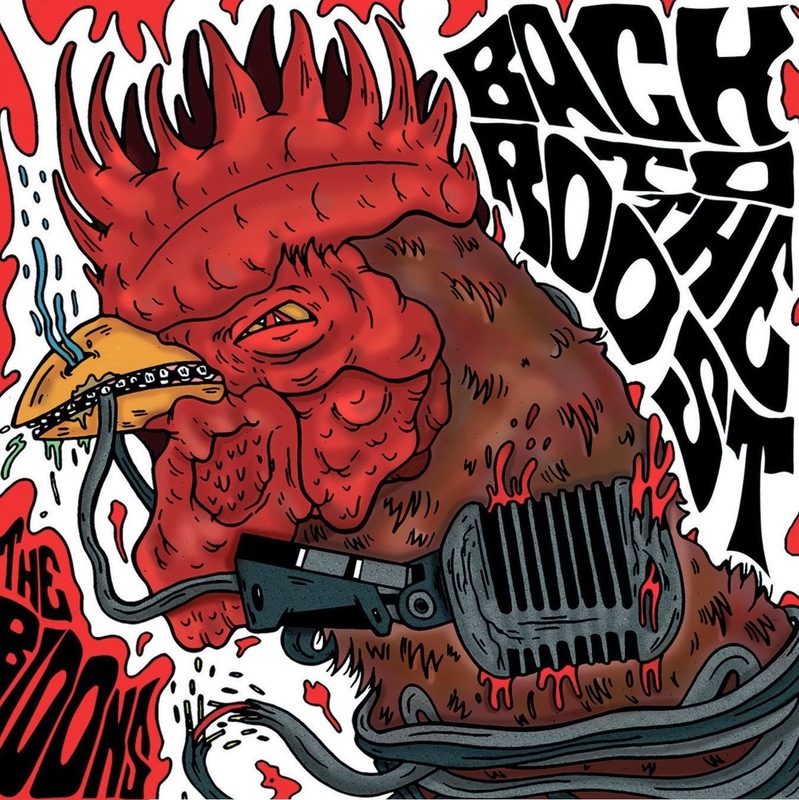 Given that The Bidons have made the consummate garage rock album, it's hard to imagine them being able to top Back To The Roost. But at this point, I won't dare doubt them! The band's brand-new lineup has reworked three tracks from the album for a live in the studio EP that releases today. Check out The Bidons' Facebook page for more info! Ladies and gentlemen, The Kimberly Steaks!